Dilip Kumar, Amitabh Bachchan & Shahrukh Khan will be featured on cover for Filmfare this month. 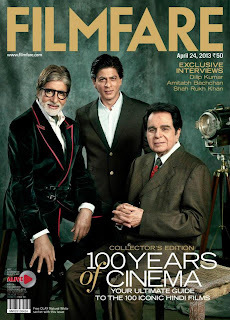 Be sure not to miss out on this Collectors Edition 100 Years of Cinema Issue. Your ultimate guide to the 100 iconic hindi films. Be sure to check out the April 2013 issue and pick up a copy online/book stores.